This is a bento for this week's bento challenge at Livejournal. I read the theme and thought, yes, something easy this time. I'll make ramson noodles. Or udon? And teddy pasta as decoration.Hm... or all 3. And whatever I find in our noodle drawer. I found two other open packages that I could use some noodles from. There were some soup noodles, too, but they would have been to small, so I just took those 5 types. 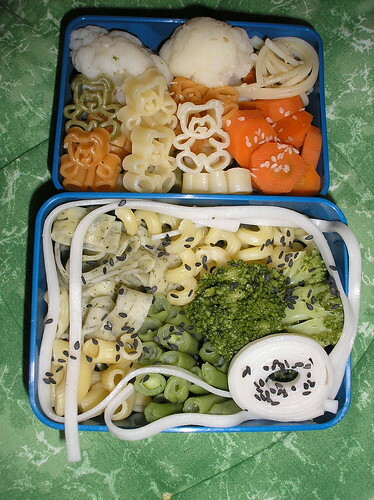 Bottom tier: ramson noodles, spiral noodles (without a name on the package), wholemeal noodles called cornetti rigati, broccoli, green beans, udon noodles and black sesame. I didn't have a sauce (any suggestions? ), but the variety made up for this. I wanted to post my last bentos on the weekend, but I'm a little obsessed with Glee and Juuni Kokki at the moment, so I spend most time watching. ^^; Have to get better. This one: "I found two other open packages..."
It's better to use "which" in this case and to start out with the preposition (although the old prescriptive rule "never end a sentence with a preposition" is outdated and in fact not true ^^): "I found two other open packages from which I could use some noodles." Thanks for the correction :) I never made a mistake with which in school, but that was years ago ^^; It doesn't sound that strange to my this way, but it probably is a false friend?